If you've had a hamstring injury in the past, it might be more vulnerable to injury in the future, especially when placed under stress. To help prevent future hamstring problems, protect your thigh while jogging, walking, hiking or engaging in other sports. 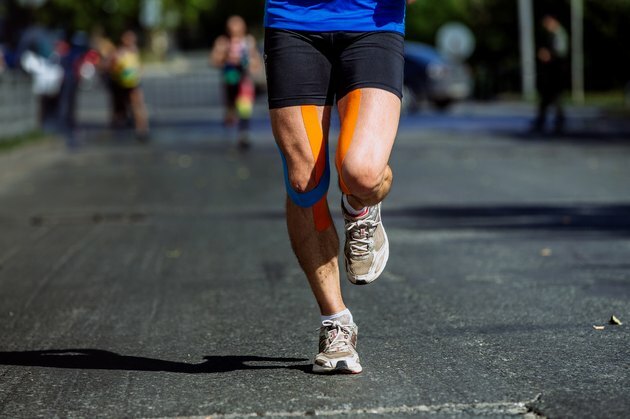 Wrapping your hamstring with athletic tape prior to performing these activities will give your hamstring the additional support it needs to avoid potential injuries. If you just injured your hamstring, ice the muscle to get the swelling down before bandaging it. Wrap an ice pack in a towel and alternate 20 minutes on and 20 minutes off, until the swelling has gone down. Use an athletic pre-wrap on your hamstring before you start using athletic tape. The pre-wrap will help the athletic tape stick in place better during your activity and help you remove the athletic tape with a bit more ease when the exercise is over. Pre-wrap also helps to prevent skin irritation. Take the athletic tape and start wrapping your hamstring. Start about 1 1/2 inches above your your knee and head up to your groin, stopping about 3 inches below the groin. Wrap the tape firmly, but do not choke off circulation in your leg. Remember you are going for a run or competing, so you can't inhibit proper circulation. The key word is snug. You want support from the athletic tape, but you still want to be able to move your leg comfortably. If you have concerns about the tape being too tight and you've received proper training in its use, wrap with kinesio tape (in which case you omit the pre-wrap). Kinesio tape — which gets its name from kinesiology (the study of the mechanics of body movement) — also benefits the circulatory and neurological systems. Elevate your leg after competing in a sporting after wrapping your hamstring. Take off the wrap and elevate your leg for at least 20 to 30 minutes. Read more: Should You Stretch a Pulled Hamstring? If you feel any sharp pain, stop competing or running. You will feel pressure and that's OK, but don't continue to participate if you feel pain.